The New York Times anunció hace un rato que distribuirá en San Francisco y sus alrededores (lo conocido como Great Area o Bay Area) 10 páginas adicionales con contenido “hyperlocal”, tal como viene anticipando el diario desde hace algunos meses. Un comunicado dado a conocer hoy asegura que la estrategia será “sumar páginas a las ediciones de los viernes y sábados” y que el contenido especial para San Francisco “será el primero de una serie de periódicos impresos y de iniciativas online”. Habrá diez periodistas del Times dedicados al suplemento especial (una especie de zonal al estilo Clarín o La Nación) a los que se sumarán colaboradores. Me llegó el comunicado hace un rato y se los copio tal cual en inglés. Cualquier cosa, como siempre, pueden chequear el sitio de prensa del diario o buscar más sobre el tema en The Media Management Blog. 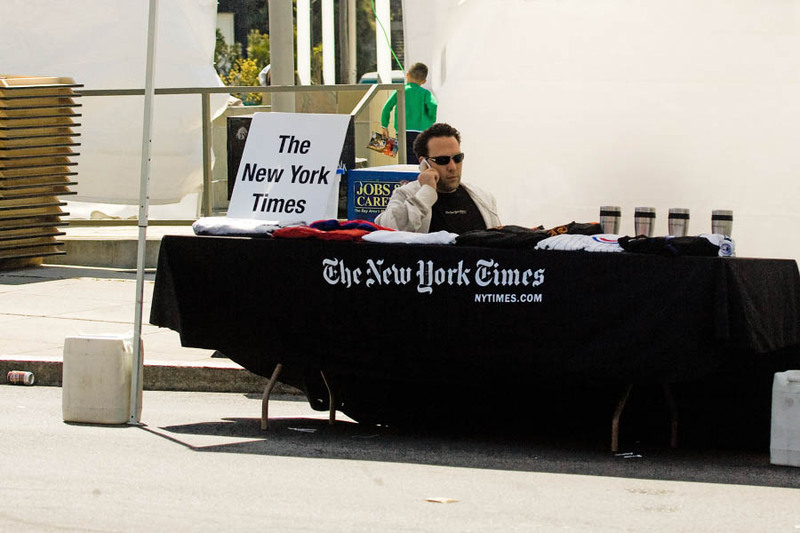 NEW YORK, Oct 15, 2009 (BUSINESS WIRE) — The New York Times announced today an expanded Bay Area metro report with added pages of local content on Fridays and Sundays in the San Francisco area. The Bay Area report will launch on Friday, Oct. 16. The new pages will complement the national and global coverage that long has made The Times a popular news provider in the region. The Bay Area pages initially will be written and edited by New York Times journalists and contributors and will include enterprising coverage of local concerns, focusing on public affairs, culture and lifestyles in San Francisco, the Silicon Valley, the East Bay and the region. The pages will expand on the work of The Times’s 10-person San Francisco news bureau and its already extensive coverage of the Bay Area. A longer-term objective of this initiative is to work with local journalists and news organizations in a collaborative way, first in the Bay Area and then in other major markets around the country. The Times is in discussions with news organizations in the Bay Area about supplying journalism for these pages. Felicity Barringer, a long-time reporter and editor for The Times, will edit the pages. Daniel Weintraub, who has covered California politics and public affairs for more than two decades, including for the past nine years as the public affairs columnist for the Sacramento Bee, will write a politics column. Scott James, a journalist and novelist who has written about Bay Area life for the past 10 years and is the founder of San Francisco’s SoMa Literary Review, will write a local column. These stories and columns will also appear on NYTimes.com. Next week, The Times will introduce a blog called “The Bay Area,” designed to complement the print pages by leading a conversation about the top stories of interest to people in the region. The Times also is in conversations with potential news providers in Chicago to provide the same kind of regional report, devoted to local news and written by local reporters with deep roots in the community. The added pages and online components for both editions will be supported by local advertising. The New York Times Company, a leading media company with 2008 revenues of $2.9 billion, includes The New York Times, the International Herald Tribune, The Boston Globe, 15 other daily newspapers and more than 50 Web sites, including NYTimes.com, Boston.com and About.com. The Company’s core purpose is to enhance society by creating, collecting and distributing high-quality news, information and entertainment.